Drilling The Roaring Fork. Really? 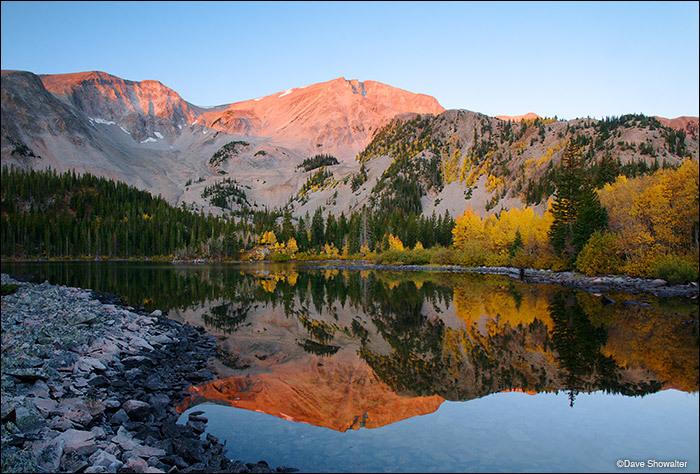 The Eastern Peak of Mount Sopris is reflected in Thomas Lakes one autumn morning in late September. This was a rare combination for me - still water for a mirror reflection and golden aspen in a high alpine lake. These aspen were just clinging to their leaves, to be dropped for the season in a few fleeting days. While tallking to someone I’d just met recently, we touched on the fracking-gas-development mess in the West. I told the middle-aged lady that fracking may soon be happening in the Roaring Fork Valley, known for the town of Aspen, movie stars, skiing, and some of the most expensive real estate on earth. The lady, who’s name I can’t recall became indignant, telling me “There’s no way THEY’LL let THAT happen, not IN ASPEN! There’s WAY too much money there.” Technically, Carbondale is down valley from Aspen, but new plans to drill the Thompson Divide as reported in The Aspen Times threaten the only buffer between the Roaring Fork Valley and the mega gas fields in the Piceance Basin. It can happen here, and a unified grassroots opposition may be the only way to prevent industrialized energy development in the Roaring Fork. I’ve just contacted the Thompson Divide Coalition, a local citizens group that is fighting for the Thompson Divide and the Roaring Fork. Please contact TDC and offer your support. Posted in Colorado, Energy on July 20, 2012 by Dave Showalter. I checked out the Thompson Divide Coalition link and tried my darndest to understand the article. It’s not that its’ written poorly it’s because I do not understand all the language involved in these issues. The legal muck involved with big industry and our federal government are something I have a difficult time grasping. That’s why people like you are needed to bring to our attention what is going on and we need to trust what you say. That is one smooth calm lake! There is a process and it’s not a given that TD will be drilled; but energy gets preferential rights to our public lands for some doggone reason. Hmmmm? I can tell you that good ol’ fashioned letter writing makes a big difference in how the decision-making process unfolds. I’ve had land managers tell me that they made a decision to protect a place based on letters from folks like you and me, telling them why the place is special. It involves some knowledge of the issues and an impassioned sharing of personal experiences on the land, along with sharing why it matters on a personal level. People need to be engaged and writing letters; otherwise we’re complicit.